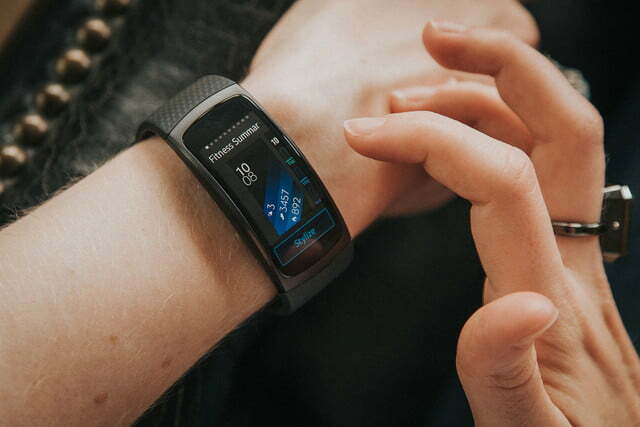 Smarter and sleeker than a Fitbit, Samsung’s Gear Fit 2 is our favorite fitness tracker. 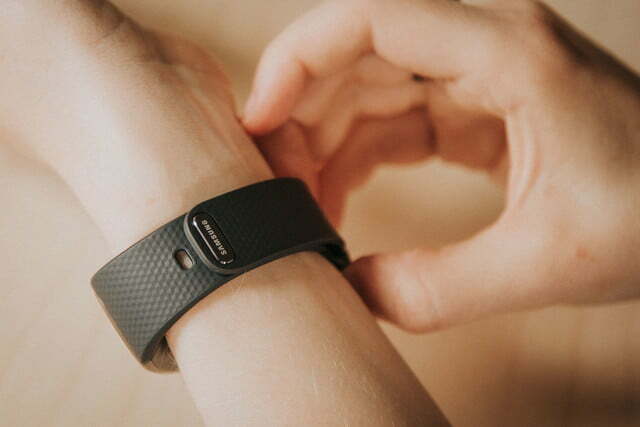 Fitbit may be the best-known name in wearables, but it has competition. 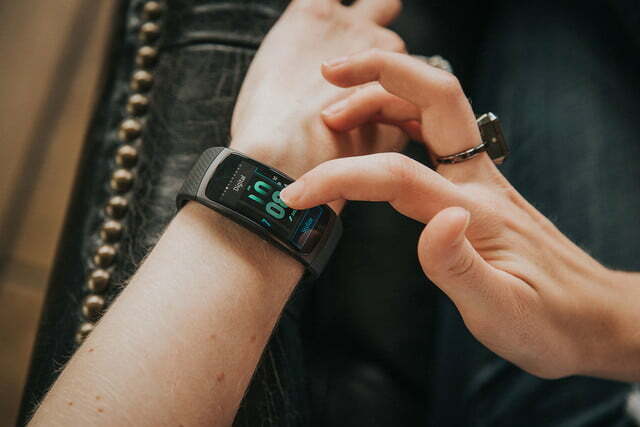 Samsung is getting back in the game with the new and improved Gear Fit 2. 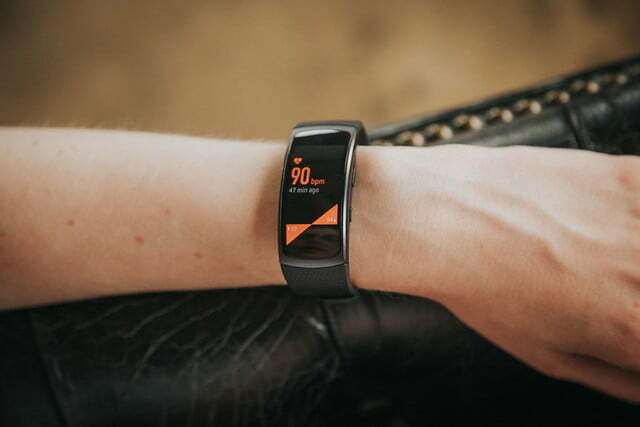 After the company released the original Gear Fit back it 2014, it took a hiatus from fitness trackers, but during that time, Samsung learned a lot. 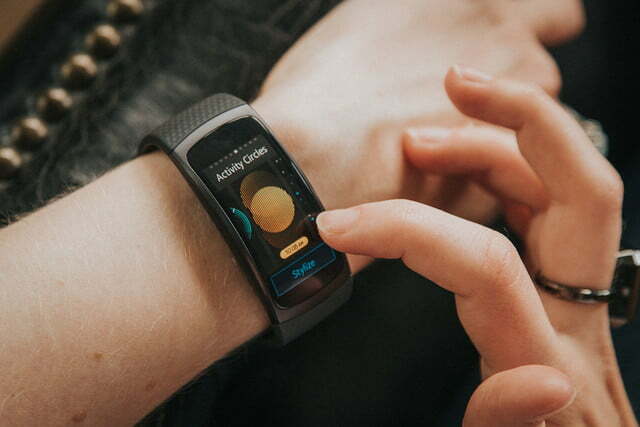 The Gear Fit 2 builds upon the blueprint of the first-generation model and improves upon it. The Gear Fit 2 does more than track your workouts, and it incorporates smarts in a brilliant way that differentiates it from smartwatches. Its attractive form factor is just the icing on the cake. 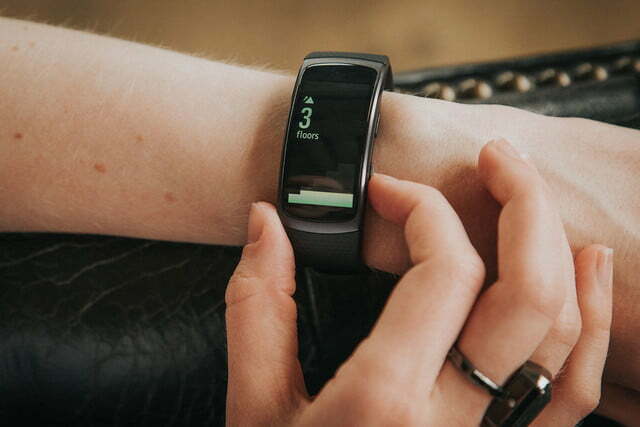 We spent a week with Samsung’s new and improved fitness tracker, which has quickly become one of our favorites. 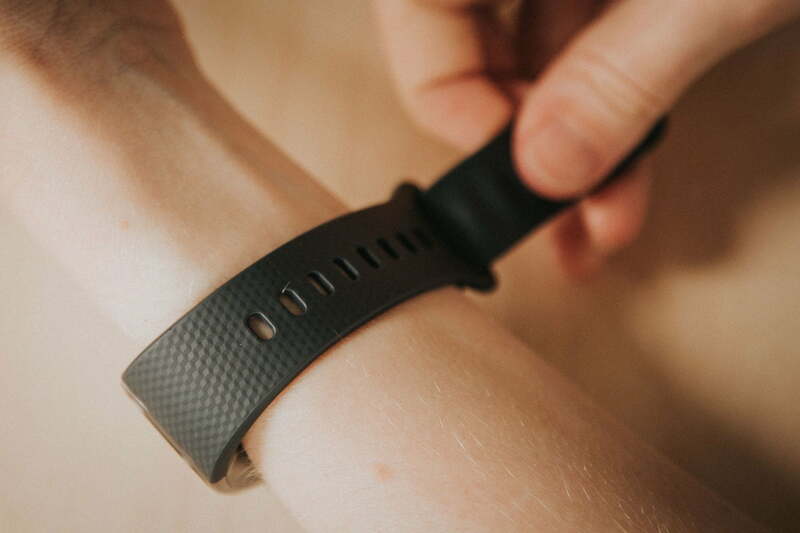 Fitness trackers are rarely glamorous or beautiful, and most of them look exactly the same: a boring silicon strap, a button or two, and maybe a screen. 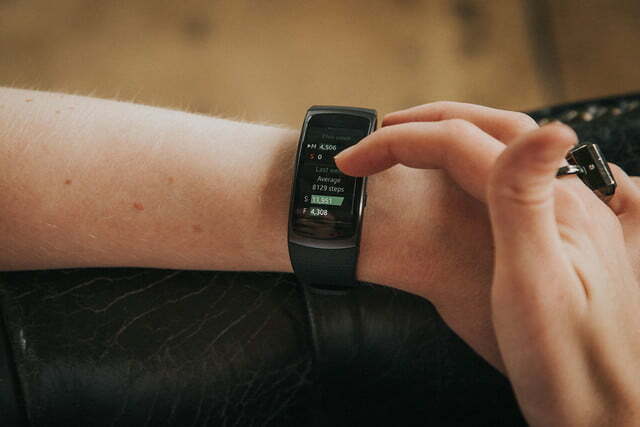 Not so with Samsung’s Grear Fit 2. 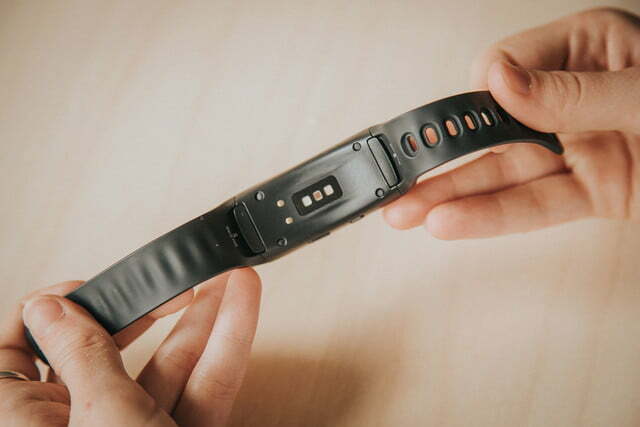 Just like the original, it has a large color screen that’s set in a silicon band, but this time, the screen curves elegantly to sit comfortably on your wrist. Although the 1.5-inch curved AMOLED screen on the Gear Fit 2 is technically smaller than the 1.84-inch screen on the original model, it boasts double the screen width. The wider screen certainly is much easier to navigate than the slimmer, less touch sensitive screens on most fitness trackers. The watch face is customizable, too. The inevitable tradeoff of having a wider screen is that you end up with a wider device. 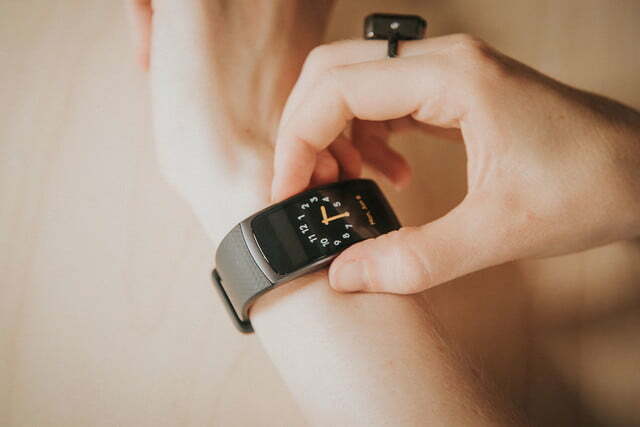 On large wrists, it hardly matters, but for those with slim wrists, the Gear Fit 2 is less attractive looking than the Fitbit Alta or the Misfit Ray, both of which are slim and pretty. 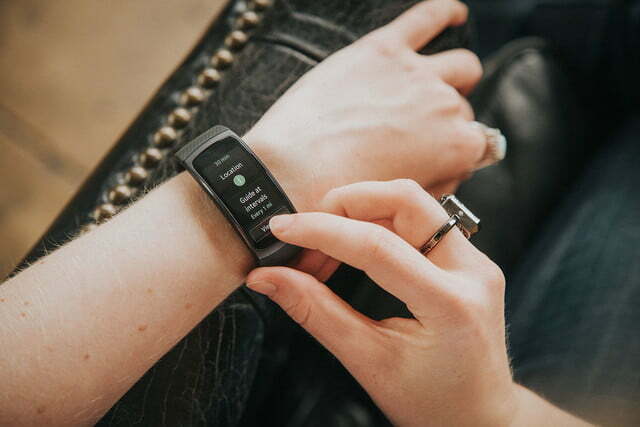 On the other hand, it offers more features than either of those minimalistic fitness trackers, including a full color screen, heart rate monitor, and GPS. Those features are only found on bulky ugly fitness trackers like the Fitbit Blaze and assorted Garmin fitness watches, so the Gear Fit 2 is a step above those in terms of both style and function. The screen curves elegantly to sit comfortably on your wrist. The small band did fit much better than the large, though the Gear Fit 2 still looked ungainly on my spindly lady wrist. Could I wear it at the gym or on a run? Sure, but I would never wear it 24/7, which is, after all, the entire point of a fitness tracker. To be fair, though, I’m not exactly the sporty type, so I asked one of my friends who runs 5Ks for fun if she’d wear it. It turns out she loved it. It’s slimmer than her Garmin running watch, the color screen is a lot nicer, and the notification support is cool, she told me. 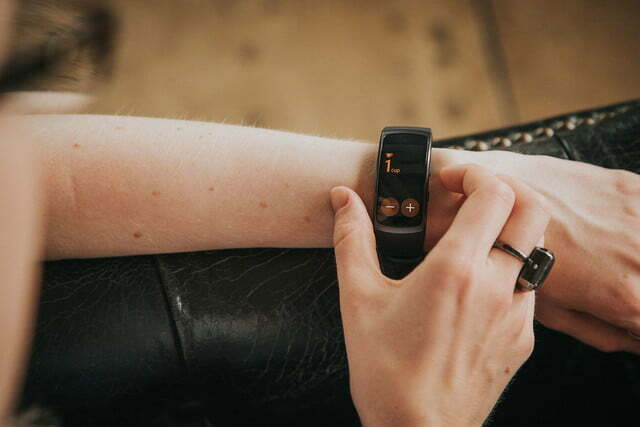 Ladies who want a less bulky fitness tracker and don’t care about GPS or heart rate should consider a Fitbit Alta, a Bellabeat Leaf, or a Misfit Ray instead; but if you want a fully-fledged fitness tracker, the Gear Fit 2 is for you. Additionally, there is good news for men. The Gear Fit 2 looks great on larger male wrists. It doesn’t look out of place with a T-shirt and jeans or a button-up shirt and a suit, and it’d fit in just fine at the gym. 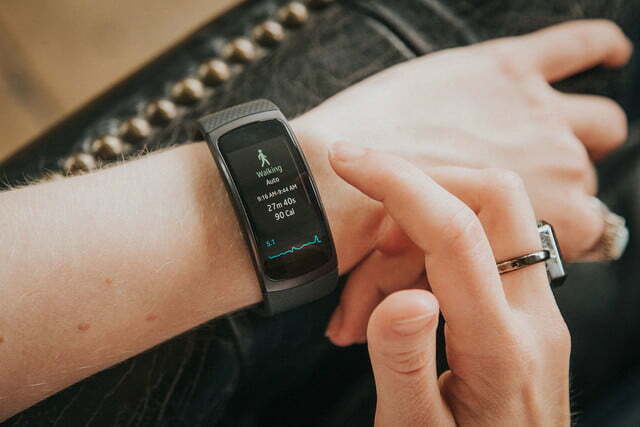 Fitness trackers are rarely stylish, but at least the Gear Fit 2 is better looking than the outlandish, boxy Fitbit Blaze and the Microsoft Band 2 with its awkward clasp. 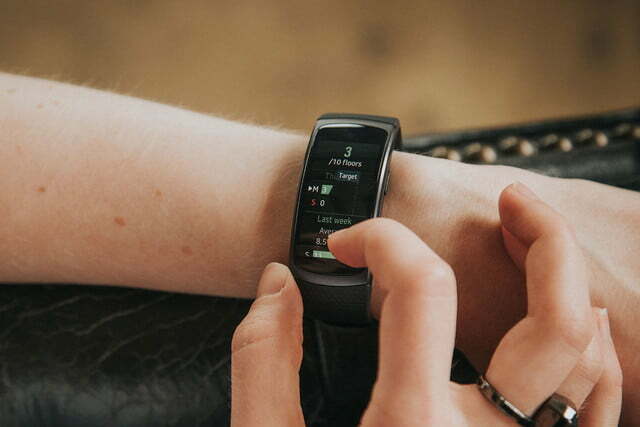 It’s also less bulky than most smartwatches and definitely less chunky than your average smart fitness watch from Polar or Garmin. It’s even water resistant with an IP68 rating, so it should be safe from rain and splashes of water. 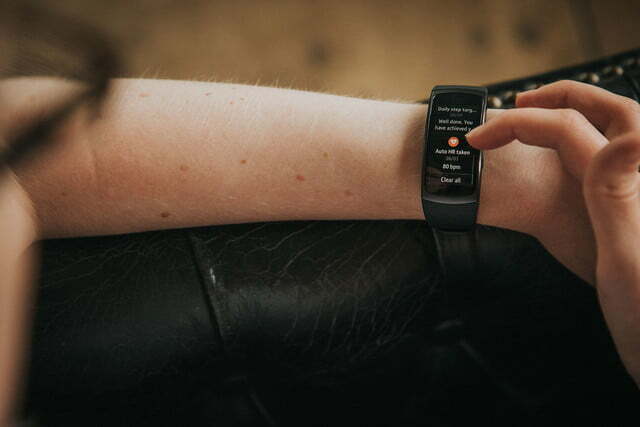 The Gear Fit 2 may be a fitness tracker, but it boasts some smartwatch features, too. 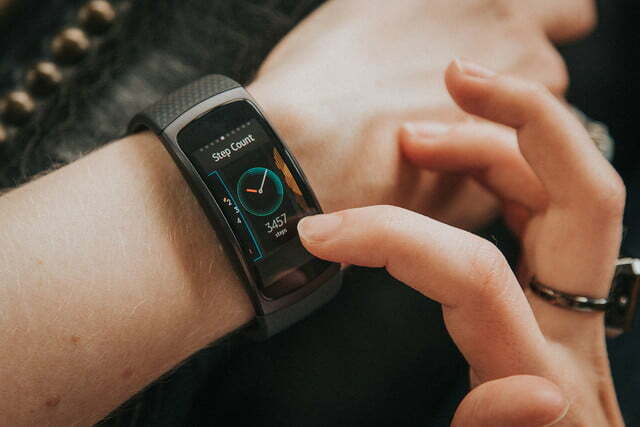 Any notification that appears on your Android phone will pop up on the Gear Fit 2. 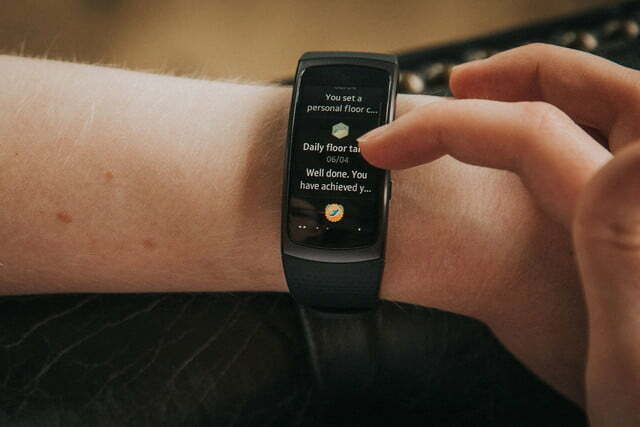 Most Fitbit-like fitness trackers only get texts, calls, and calendar alerts from the default apps on your phone, which is really annoying if you use third-party alternatives. Notifications aren’t the focus on the Gear Fit 2 — in fact, they’re relegated to a scrolling list a right swipe away from the watch face — but they’re a great bonus. Although you can’t use voice dictation to send unique replies to texts or calls, you can send canned replies or emoji. You can also download a few Gear apps on it like you would on a smartwatch, but the selection is limited to a few workout apps at present. Those apps are just a button press away at any time. That’s where you’ll find Spotify for music streaming, too. In addition to smartwatch-like features, the Gear Fit 2 boasts GPS and a heart rate monitor. The screen provides real-time data while you’re exercising, and it’s nice that you can see everything without having to sync up with an app on your phone. 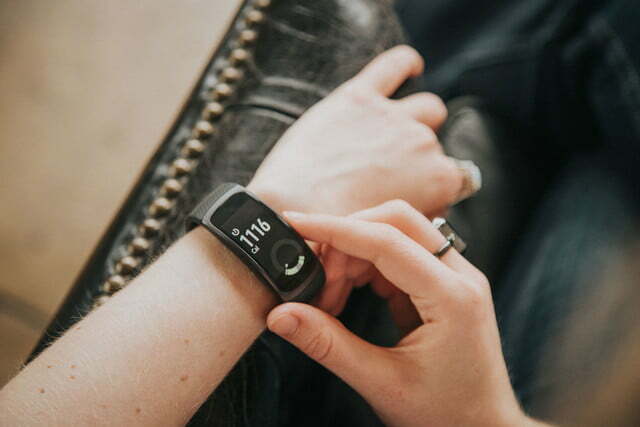 Naturally, the Gear Fit 2 tracks your steps, distance travelled, calories burned, and other common fitness stats. It has a barometer to detect your elevation. The coolest feature on the Gear Fit 2 is automatic workout tracking. 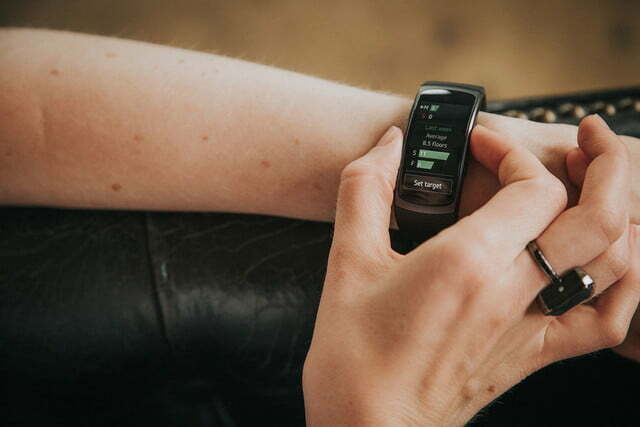 In other words, the device knows when you start running, biking, or working out on the elliptical. It automatically detected that I was walking to work, and let me know everything from my speed and distance travelled, to the calories I’d burned. It did the same for runs, which proves that it can identify different activities. 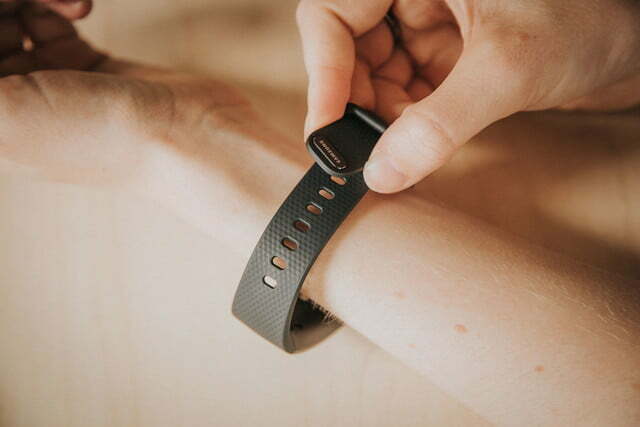 You will have to let it know you’re doing yoga, pilates, and other activities that are harder to sense, but that’s typical of fitness trackers. I did some yoga with it, and in the breakdown, I got heart rate info and how long I was active. 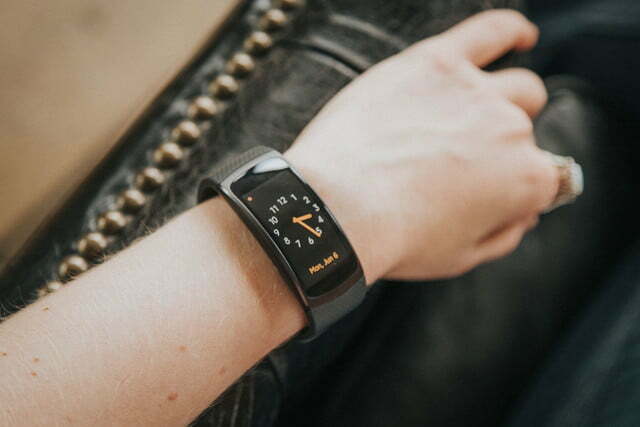 Another interesting feature that makes the Gear Fit 2 stand out from the crowd of fitness trackers is its ability to stream music directly from Spotify to a pair of Bluetooth earbuds or headphones. Sadly, this only works if your smartphone maintains a connection to your Gear Fit 2, since Spotify requires an internet connection to function. This feature wasn’t available at the time of this review, so we’ll update this post soon with more on Spotify. However, if you happen to have your own workout playlists, you can download them onto the Gear Fit 2 for phone-free music while you exercise. The device packs 4GB of storage onboard, which should hold hundreds of songs. The Exynos 3250 and 512MB of RAM ensure that the device runs smoothly, especially since that’s the same amount of RAM that powers most smartwatches. It’s slick and polished – much like a smartwatch. 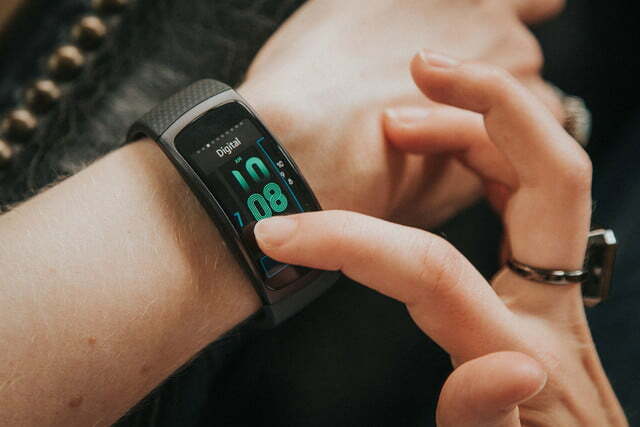 Since the Gear Fit 2 boasts a full color AMOLED screen, it’s very easy to see all your fitness data at a glance. 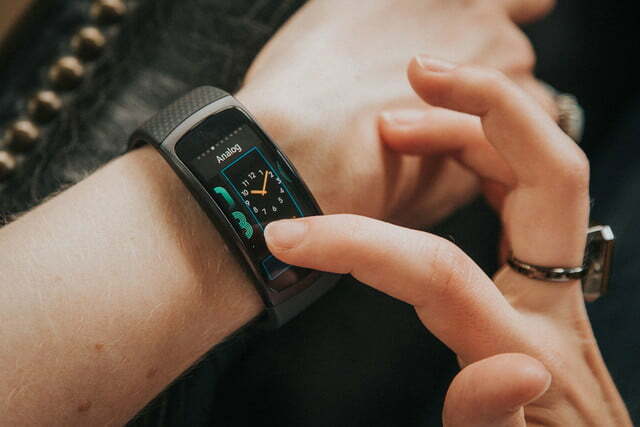 The wearable runs Samsung’s Tizen OS, just like the Gear S2 smartwatch, but since the Fit 2 is rectangular instead of round, and focused on fitness instead of information, the operating system looks quite different. It takes a lot of swiping and scrolling to see your fitness metrics. 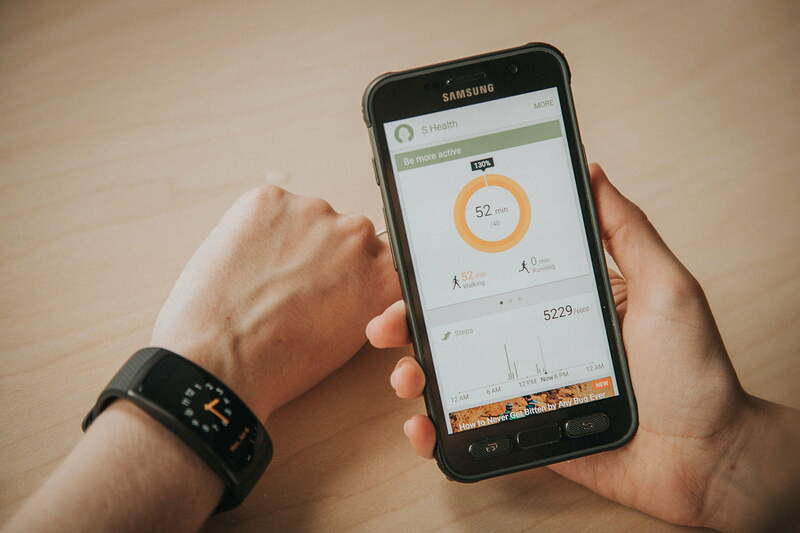 You swipe through several screens, including your notifications, calories burned, workouts, steps, floors climbed, heart rate, water intake, caffeine intake, and the leaderboard where you can compete with your friends. Samsung’s Gear Fit 2 is the best fitness tracker we’ve ever used. You can reorder those screens to suit you and delete the ones you don’t need. All you have to do is press on the screen. I recommend cleaning house a bit to avoid information overload. Inside each of the screens there is more detail if you tap and scroll through all the data. For example, if you go into the workout menu, you can tap to see all the details from your last workout, including a map of your route. There, you can share your workout on Facebook, if you want to brag. Inside the workout menu, you can also start a new workout with a specific exercise. Each menu is laid out in a similar way, so it’s a bit difficult to navigate through all that data. There is almost too much going on at your wrist, and it can be overwhelming to go through everything. My biggest complaint with the layout is that it’s hard to see your workout log on the Gear Fit 2 afterward. It’s buried in the workout screen at the bottom of a scrolling list. It would be nice if Samsung added another screen for your log, so you could see what you’ve accomplished more easily on the device. 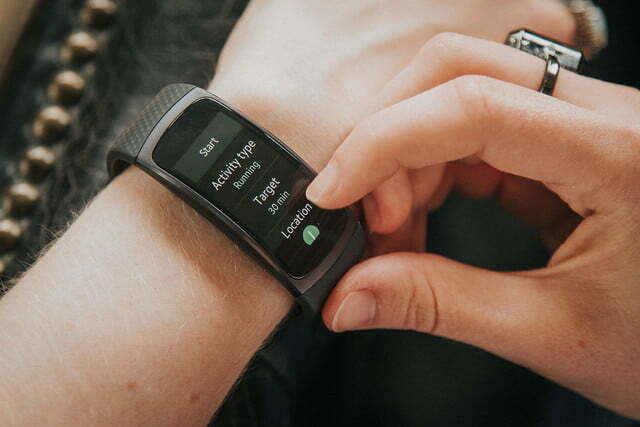 Otherwise, it’s easy to switch workout types and get moving with the Gear Fit 2. When you really want to analyze your stats, though, break out S Health on your phone. As for battery life, the Gear Fit 2 should last 3-4 days on a single charge, though if you stream Spotify from your phone via Bluetooth, it may run out faster. Luckily, it’s easy enough to charge with the magnetic charger. In my testing, the Fit 2 lasted 3 days before needing a recharge, which is fantastic and beats out most smartwatches and some fitness trackers. We’ll let you know how long it lasts when streaming Spotify, though. 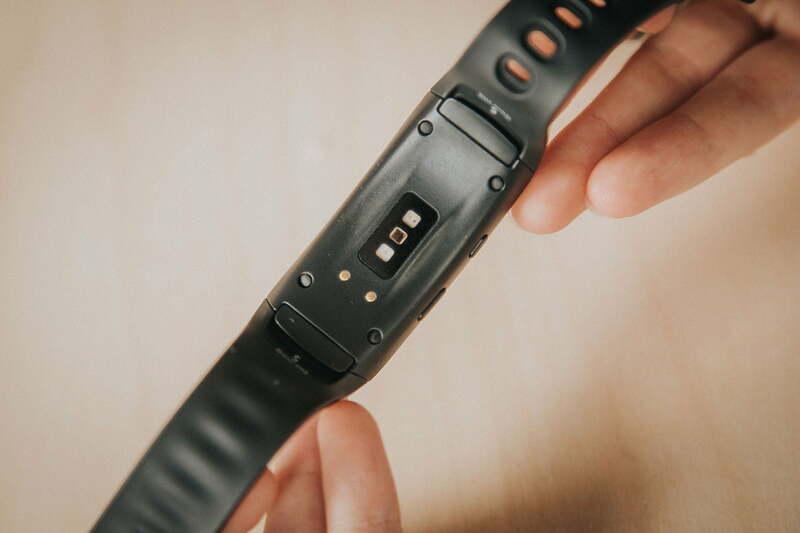 The Gear Fit 2 has a one-year warranty that covers the device itself, the battery, and select accessories like the charger. If you have a defect, you can get a replacement; and so long as you didn’t do anything crazy like smash it with a hammer for fun or throw in the pool for hours, Samsung should cover repairs. Samsung’s Gear Fit 2 is the best fitness tracker we’ve used. Most sporty wearables are all the same these days, and they’re still incredibly ugly. The Gear Fit 2 is a breath of fresh air with its subtle design, smartwatch-like features, and ability to stream music during your workouts. 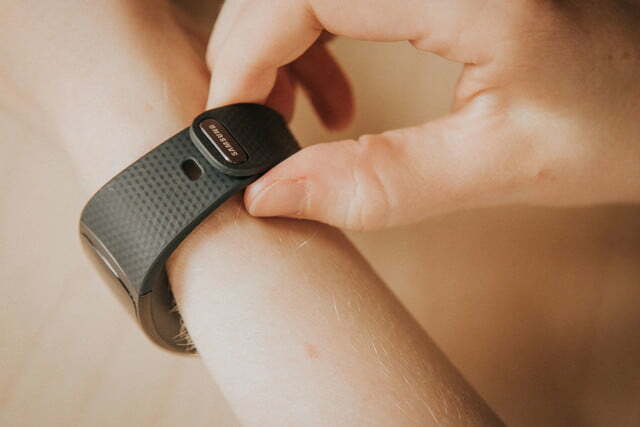 The auto-workout tracking is awesome and it really works, so you can exercise naturally without having to press a button every time you go out for a run. For $180 it’s a great deal. The Gear Fit 2 is significantly cheaper than any smartwatch you can buy, and it’s even cheaper than some Fitbits, despite having more features. If you’re looking for a smart fitness tracker with heart rate, GPS, and notifications, the Gear Fit 2 is for you.